American alligators or Gators are one of the two species of original alligators, of the family of Alligatoridae. This reptile is a good example of pre-historic reptilian genre of dinosaur family, as they have undergone almost negligible changes since their existence. According to scientific research, this species is more than 1.5 million years old. Kids can classify this creature as monstrous form of a lizard. Their habitats often partly cover human inhabiting land area. Farming of this species is a growing interest in many states of USA. 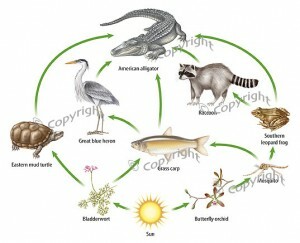 They are also commonly known as Mississippi alligator, Alligator mississippiensis and Gator. Size: Largest American alligator found till date has recorded to be of 19.2 ft. Female adults of this species measure up till about 8.2 ft. and the males tend to stretch till 11.2 ft. Weight: Most adult alligators of this family weigh between 76 kg and 360 kg. Color: Color of the adult American alligator range from black to dark grey. Head: The head is long and quite big in overall proportion as well. A pair of round, small eyes are placed right on top descent of the head. Though the nose is not distinguishable but the nostrils are clearly visible. Jaws: This monstrous reptile has very strong and wide opening jaws. Inside those mighty jaws adorn 74 to 80 sharp, pointy teeth. When their teeth erodes away in due course of time, new ones appear. They experience about 2500 to 3000 teeth during their life span. Body: Their bodies are roundish in shape and huge. The bodies are covered with hard and pointed, bony plates. These plates are called scutes or osteoderms. Tail: These alligators have a very strong, flat, muscular tail. The tail is also covered with scutes. Feet: They have four legs. These legs are very short, having five toes on the front limbs and four toes on the hind limbs. These reptiles are found in South Carolina, North Carolina, Virginia, Florida, Georgia, Alabama, Oklahoma, Louisiana, Arkansas, Mississippi and Texas. Female alligators occupy a small range but the males dominate over 2 miles of area each. But both the sexes broaden their inhabiting range during the mating season. As to where do American alligators live, they tend to inhabit areas near water patches. They are fresh water dwellers, finding home in or near rivers, swamps, marshes and bayous. Despite being originally fresh water creatures, these alligators are also tolerant to slightly salty and impure waters. They have a glorious history that dates back even before the origin of dinosaurs. These alligators have been apex predator way before the mammals took over the ecological food chain. Let us find out what do American alligators eat. These reptiles are carnivores along with being opportunistic feeders and not very choosy. Young ones mostly diet on marine invertebrates and small fishes. 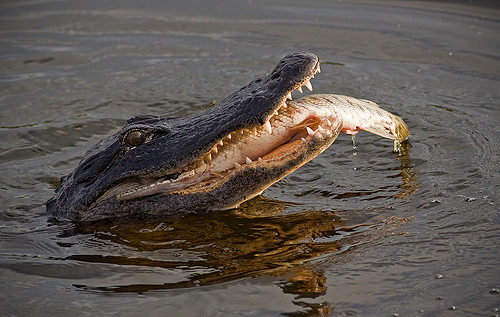 Adult alligators feed on turtles, snakes, fishes, small mammals, frogs, smaller alligators and wading birds. 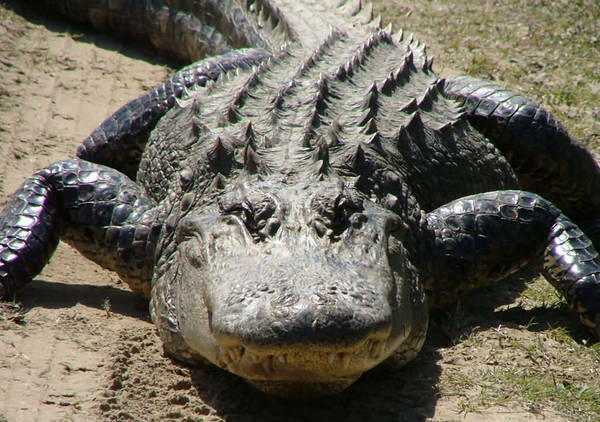 American alligators’ zoo diet comprises of mostly rats, rabbits and occasionally chickens. This alligator swallows the whole prey if it is smaller in size and the bigger ones are dragged under the water where they are killed and eaten. These huge reptiles are apex predators which means they exist on the highest strata of the predation ecological pyramid. These crocodilians are very much adaptive to cold temperatures and thus suit themselves well enough to climatic conditions of their distributional zones. Their color helps them camouflage in their wild habitat. Their teeth grows throughout their life span as and when wears off, enabling them to keep preying and tearing off the other species of animals for their diet. These alligators mate during the spring season. These alligators reach reproductive maturity at the age between 6 and 10 years. They do not posses vocal cords. The males make a humming sound by inhaling air and then grumping out, creating an effect of infra-sound, to send out signals to the females as well as notify other males from coming near to their mates. They submerge their bodies into water keeping their backs just a little above the water surface level while keeping their heads and tails well above the water level. This act is called “water dance”. They have been observed to gather in groups at nights and engage in group “alligator dancing”. A female lays about 20 to 50 eggs at a time that are white in color and size of goose-eggs. The incubation period lasts for about 65 days. Gender of the young one reproduced is decided by the temperature at which the egg grows. The eggs that hatch between the temperature 32 degree and 34 degree come out to be male juveniles and those between 263 degree and 32 degree come out to be females. Female American alligators build their nests with sticks, vegetations, leaves and thatch them together with mud. This nest is built near water bodies. Females stay in or near the nest the entire incubation duration. The eggs are kept in these nests and covered with vegetation. As the vegetation decomposes it produces more heat which keeps those eggs warm. Juveniles look ditto like their parents apart from absence of the spikes on the back. Instead they have thin yellow stripes all over their body which gradually disappears with age. The young ones feed on the yolk mass till a few days post hatching. They frequent the waters since birth. The new born ones leave their mother alligators and goes to the water unattended after 5 months from their birth. They become completely independent at the age of 2 years. Till the time these alligators reach reproductive maturity they grow in a steady pace. After the age of 6 to 10 years their growth rate decelerates. 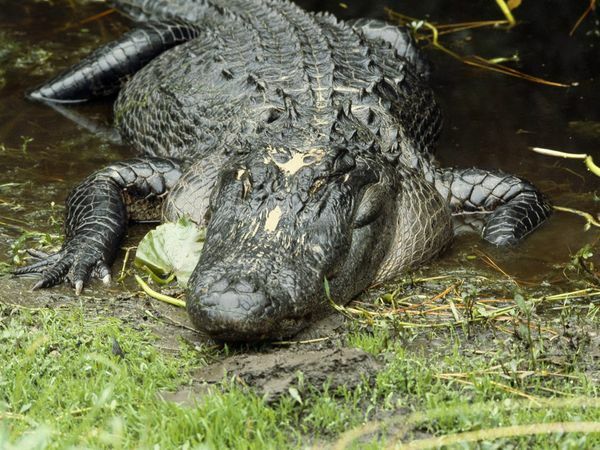 On average these alligators live up to about 50 years of age in the wild. In captivity, usually they do not survive above 30 to 35 years of age. This reptile has no vocal cord, so they cannot call out. But during mating season they inhale a large amount of air and grumps out in a “humph” sound. It has been observed that an American alligator, when moves at its maximum speed which is 20 miles per hour, can move faster in water than a canoe, padded by a human. It is also noticed that the speed can be held up to very short distance coverage only. This reptile has some very interesting behavioral patterns. Apart from being very aggressive and seldom cannibal they have some unique traits as well. It digs a deep hole in mud when the weather is extreme hot or cold. This den is called gator hole. Unlike other reptiles, American alligators do not hibernate during winter. It becomes dormant though. They are agile swimmers. They tend to float on water, completely submerged with only nostrils and eyes above water to look out for prey. Big males of this species are extremely territorial and solitary in nature. Smaller ones can be seen in groups also due to their higher tolerance level. American alligators are at the top of ecological food chain. See the ecological chart below. Check with the state laws about petting these alligators unless farming them. American alligators are available on sale on many websites. 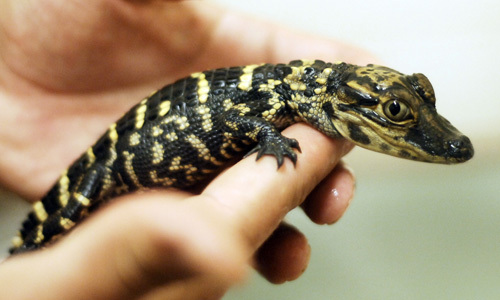 You can bring one juvenile home and care for the reptile. Housing: Housing the American alligators requires a huge water tank. If natural habitat is to be provided to them then a huge piece of land and a big enough water body is needed within the land premises. Preferable to pet them in an outskirt farm house premises to ensure safety. Temperature: The water temperature should not be very cold or too hot. Land temperature cannot be controlled, but it is advised not to pet this species where the climatic conditions are extreme. Feeding: They can be provided with as much natural diet as possible. Occasionally, some supplements can be brushed on their food for their proper nutrition. Care: Remember, this is not a conventional pet and very aggressive. So treat them as wild and untamed ones. To show your love and care for your very own home grown American alligator, you don’t need to handle it on lap. Take proper care of their housing, feeding, safety, health and other necessities. It is legal to hunt American alligators in USA for its various economic uses. Different states have different seasons for hunting of these alligators. This is one of the most expensive species of reptiles that are hunted for its economic uses in human world, which is the only threat that these apex predators face. The flesh of this alligator is a very expensive delicacy in the civilized world as well as tribes. Skin of this reptile boasts of very high price and demand in the fashion world for manufacturing accessories like handbags, shoes, belts, jackets etc. Even teeth of this alligator have show value and thus are exported around the globe. Research emphasizes that about 5 millions of these alligators are distributed across southeastern parts of USA. Further towards the state of Florida, about 1.25 millions of them can be found. Some estimates show that the global population of the species is only 1 million. American alligators, in USA, are found only in the southeastern parts. They inhabit fresh water bodies and wetlands. Adult males of this species measure up till 11 ft and females 8.2 ft. They are dark grey colored. These reptiles can bear quite low temperatures. Grown up alligators of this species can weigh up till 360 kg. American crocodiles are distributed only in the southern Florida in USA. This species of reptile prefer the coastal lines as habitat. The matured males of this species can be of 13 ft. and females of 9.8 ft. in length. These crocodiles are much pale grey colored than American alligators. This species is more vulnerable to cold than the American alligators. These crocodiles can weigh up till 385 kg. Sometimes the question pops up why the American alligator is endangered. But their conservation status is quite contradictory. These alligators have no threats to their race’s existence as of yet and show no concern for the same in near future as well. They have been rated as “least concerned” species by the IUCN. During the years from 1967 and 1969, this species had become endangered due to hunting for its skin and flesh. Then the species recovered its existence status. Nowadays, it is sometimes listed as “endangered” but that is due to its extreme similarity with the American crocodile which is becoming endangered. But as to how many American alligators are left, there is no information. Let us find out some very interesting and fun facts about this reptile. It is one of only two species of true alligators of its family. The other is Chinese alligator. These alligators are the only creature that has not evolved much since the pre-historic days. They are the official reptile of the state of Florida. Since they do not have vocal cords so they headslap at the water surface and jawclap as communicating signals. These alligators undergo 2000 to 3000 teeth in their lifetime. Those alligators which are larger in size are solitary but the smaller ones live in groups. This species is hunted by humans for the economic value their skin and flesh. In the year 1967, this species had become endangered. But gradually they recovered their existence status and are completely safe now. Their growth rate slows down after reaching sexual maturity. Though they are apex predators but still the risk of eaten by bigger animals while in juvenile stage is always there, including falling prey to cannibalism. Best way to differentiate alligators from crocodile is to demarcate the shapes of their heads. Heads of alligators are U-shaped and that of crocodiles are V-shaped. Interestingly and bizarrely, the closest modern kin to these alligators are birds. They have poor eye sight but very sharp ears and sense of vibration which enables them to be such great predators. A very common myth amongst the tribes is that alligators live up to 500 years of age. Images of this fierce apex predator given below will help you visualize this creature. I fear snakes more than alomst anything (cockroaches have 1st place via childhood trauma). Have tried getting over the fear-but..um..it didn’t workBut I have to say…Ramona is one beautiful snake. Such vibrant colors and sheen and lines.And that’s the first time I have used ANY nice words about a snake. Actually, the eyesight of alligators is on par with owls. This enables them to see well from the bottom of lakes/streams at their prey above.